At some point in their woodworking endeavors, most people will find themselves doing inlay of some sort. It might be intentional, such as the addition of stringing to table legs or banding to the lid of a box, or it might be to cover up a mistake, like when I had to inlay an escutcheon into the front of a box to cover up an error I made cutting the key hole. Whatever the reason, it never hurts to have a book handy to get you through these times. 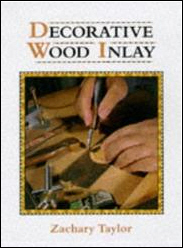 Decorative Wood Inlay is the first book I reach for when I want a refresher to get me prepared for my next inlay venture. Zachary Taylor is a woodworker from England who comes complete with the dry, wry humor we tend to associate with our brethren from across the pond. His writing style is clear and concise and easy to follow, but also very “British”. While wordsmiths will find joy in such sentences as, “The stroke is completed with the same attitude of the blade to the hone,” others might have trouble digesting the English nuance. In this case, he means the blade should be in the same position on the sharpening stone when it ends as when it began. The book is organized in an easy-to-follow format, beginning with a brief history of inlay and ending with, as he so aptly puts it, “the finish”. Some of the chapters are a bit sparse, like the history (well… he does call it “brief”) and the last two chapters on adhesives and finishes. In his defense, however, I would point out that a book written on inlaying wood in a decorative manner should mostly cover the process of inlaying wood and not focus on the most basic mechanics of woodworking. The first few chapters are useful to the beginning woodworker who already knows they want to incorporate inlay of some sort in many of their pieces. Chapter 2 covers the tools and equipment one might find useful while Chapter 3 discusses what Mr. Taylor deems to be important features for a shop setup. It is important to keep in mind that his ideal workshop is created with his kind of work in mind, so it certainly wouldn’t work for someone who builds kitchen cabinets for a living. The bulk of the book, of course, is spent discussing various types of inlay, covering several techniques for each type. Mr. Taylor starts with one of the simplest types, corner banding. His first method uses a custom purfling tool made for him by Karl Holtey, one of Britain’s master plane makers (drool). The second and third methods involve multi-tools (e.g. Dremel) and hand-made scratch-stocks. He follows this process for each technique he discusses – how to perform the function with a variety of tools, going into enough detail with each method that they all seem comfortable and do-able. Throughout the next chapters, he outlines inlaying stringing, inlaying curved stringing, inlaying panels and motifs, and inlaying irregular shapes. Each technique he discusses builds upon the previous, finally ending with the high-end techniques of inlaying guitar rosettes and purfling. Over the past seven years, I’ve amassed a nice little collection of woodworking books. Many of them are quite enjoyable and do get read from time to time. But this book gets pulled down from the shelf for reference and for reading pleasure more than almost any other. I think it would be a fine and inexpensive addition to any woodworker’s library. ← She has us pegged! This is another book review carried over from my old blog to the new one. It’s one of my favourites! Too bad about Karl’s not making any more of the purfling tools. On the page that image links to, you can see my comment to him from a few years ago about it. Anyone happen to have one they wouldn’t mind parting with? so many choices out there that I’m totally overwhelmed .. Any suggestions? Thanks a lot! I love WordPress. Highly recommend it. I did pay a little ($15/year) to get the website without the “.wordpress” in the address, but the free option is just as good. I love that you can add different pages, which I’ve used for a gallery and background information and such.